Submitted by JoeKeresztury on Sun, 03/14/2010 - 04:34. In the roof frame of a home, collar ties and rafter ties are commonly confused for one another. Both are horizontal framing members that serve different purposes and are both important to a properly framed roof. 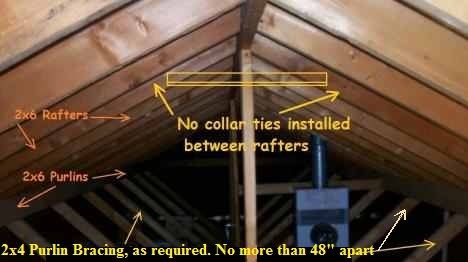 Collar ties are connections between rafters at the upper one third of the roof area just below the ridge and are required at every other rafter of a 24" on center spacing and every third rafter with 16" on center spacing. Metal Brackets or Straps can be an acceptable alternative in lieu of the more common use of the wood framed collar ties. Collar ties prevent rafter separation and uplift. Contrary to belief collar ties do not prevent wall separation, they are intended to prevent rafter/roof uplift. Collar ties as per current IRC code are required to be at least 1x4(nominal) material but are most commonly at least 2x4's. This is on a conventional stick frame (non truss) structure, as trusses do not require collar ties from a framing material as they are tied together with metal plates / gussets. Also, an engineered truss roof frame does not ordinarilly have a ridge. Rafter ties are installed as low as possible as they are required to be in the lower third of the roof frame area to prevent exterior walls from spreading. Spreading walls will create a sagging roof. Ceiling joists serve as Rafter ties when they are running the same direction as the rafters and are tied together with them at the exterior wall. When the ceiling joists are running perpendicular with the rafters then rafter ties are run above the joists in the direction of the rafters and are fastened to them. Rafter ties when not also serving as ceiling joists are required to be at least a 2x4 material and should be on edge. These rafter ties running perpendicular above the joists need to be a maximum of 48" on center apart, which would be every other rafter on a 24" o.c. spacing or every three rafters on a 16" on center spacing. Rafter ties (not serving as ceiling joists) that are running above and perpendicular with the joists can sit on the joists and also be fastened to them thus also serving as strong backs to help prevent ceiling joists from twisting and sagging. Purlins on a roof frame serve the purpose of preventing rafters from being over spanned and sagging. Purlins are placed under rafters in a perpendicular position on edge (not flat). The purlins are supported by vertical or slightly angled bracing. The braces (struts or kickers) should be within every 4' and should not be at a greater than a 45 degree angle towards the roof slope (lower side). In this image you can see the collar ties as required. Ceiling Joists serving as rafter ties are shown in both images. Purlins are present for rafter support. An important notation is that the purlin braces are off of walls as needed. Bracing can not be off of the ceiling (joist) frame. Left Image- Bowed exterior wall due to missing Rafter Ties. Image at right shows a sagging Roof Ridge as a result of the missing Rafter Ties and the bowed out exterior wall. In this photo, the collar ties as required are missing, the purlins with bracing are properly installed. Ceiling joists serving as rafter ties as seen in above image as needed were verified at the inspection of the San Antonio home seen in the photo. Purlin braces or any other roof braces, ridge braces, hip rafter bracing along with valley bracing must not be supported off the ceiling joists. Bracing must be installed off of walls or beams. Larger joist framing materials, for instance 2x10 or 2x12's can be doubled or tripled up with plywood in between and glued to create a flush beam to brace off of as long as it is not over spanned, so as to prevent deflection. Over a long span room area not having anything to brace the roof off of a floating beam can be added above the ceiling joists to brace off of. When ever beams are added and are bearing on a wall solid 2 x 4's should be filled in under the beam in the wall frame to match the width of that beam. A triple 2 x 12 beam should have at least 3 solid 2 x 4's underneath it, not just below the double top plate but also above it if the beam is not resting on the top plates. These beams at their ends should be blocked / braced with framing pockets to prevent twisting and turning. A dropped (exposed) beam is the third alternative when space limitations prohibit the flush beam or raised/ floating beam from being added for roof support bracing. JWK Inspections is available for Home Inspections in San Antonio and surrounding areas Monday thru Saturday. Commercial Inspections, Consulting and Construction Management Services are also available. Submitted by Marcel R Cyr (not verified) on Wed, 03/17/2010 - 05:29. Good article Joe. So many homeowners do not know the difference and as far as that goes, a lot of builders don't know the difference. I liked your article on slab on grade in the San Antonio area. Spent two weeks there and very nice place. It is important to know that in different Geographical areas the type of construction and design is unique for the area and differs very much to say like here, Maine. Maine has a frost line of 4' all the way down to 8' in the Northern part. Submitted by JoeKeresztury on Wed, 03/17/2010 - 07:52. Thanx Marcel, I didn't know you had visited San Antonio. Submitted by Bert de Haan (not verified) on Thu, 07/15/2010 - 05:58. Very nice Joe. I think we may be struggling with a language barrier between Canada and San Antonio Texas :). For instance we don't call supports for rafters, purlins. Here purlins are on top of the roof. Submitted by JoeKeresztury on Thu, 07/15/2010 - 11:59. Thanx for checking in Bert. Sure does sound like we have some terminology differences in framing construction. There are alot of similarities, but I am surprised by all the differences. Kinda like the big weather differences in Kitchener Waterloo, Canada as compared to here in San Antonio. Of course another big difference is foundations. We have mostly slab foundations in San Antonio while you have basements in Mid western Ontario. I was surprised to find out from you on the Home Inspector Pro Message Board that ya'll actually insulate the basements and also heat the basements. Submitted by Anonymous (not verified) on Mon, 08/22/2011 - 22:59.
so, is it upper or lower 1/3 for the collar ties? Please confirm, it is not clear here whether collar ties and rafter ties are the same and you mention both locations, danger here! Submitted by JoeKeresztury on Tue, 09/13/2011 - 07:20. Anonymous (CF), it is very clear in blog/article above, that the collar ties are upper third and different than rafter ties that are required in lower third. Submitted by Gary Young (not verified) on Fri, 01/06/2012 - 00:55. Short story about a collar tie incident. I was investigating a complaint from a homeowner that stated she had just had a garage door installed and now her garage was starting to fall down. The installer was not responding to phone calls. In my inspection it was obvious the installer cut 3 collar ties to install a non folding/swing type door. The collar ties were cut out to allow swing room for the door to lift. The ridge started sagging like a camels back. I was able to contact the installer and get him back to jack the ridge back into place and reinstalled the collar ties a little higher this time. Everyone was happy. Submitted by JoeKeresztury on Mon, 01/09/2012 - 03:12. Submitted by Gary DeWitt, CCI (not verified) on Tue, 01/10/2012 - 02:59. It always amuses me to see roofs sagging as I walk or drive down a street, especially garage roofs. You can tell who is storing way too much weight in their garage "ceiling"! Submitted by JoeKeresztury on Sun, 01/15/2012 - 05:26. Submitted by Shine (not verified) on Sun, 02/05/2012 - 11:41. Thanks for the explanation. I didn't know anything about collar and rafters ties before. It's good to be educated on this. Submitted by Anonymous (not verified) on Fri, 02/24/2012 - 19:44. Is it posible to put a purling bracing on top of a door that has a 2x12 header? Submitted by JoeKeresztury on Fri, 02/24/2012 - 22:21. Yes, it's definetly okay to brace off the top plate above a door opening that has a 2x12 header. Submitted by Rick Sierra (not verified) on Wed, 04/25/2012 - 09:07. Joe - This is very informative. One question though regarding purlins. When using purlins is the span then calculated to the purlin? For example, you get a 16'3" span with a 2x8 (assuming douglas #2 with 20 live 10 dead). Would you then be able to get a 32' span if you have a purlin in the middle? If no, how then do you calculate the additional span created by adding a purlin. Submitted by Anonymous (not verified) on Sun, 04/29/2012 - 23:18. Rick, yes (with purlin installed) the span is then calculated to the purlin. The purlin bracing is installed for that reason, for preventing over span of the rafters. Submitted by Anonymous (not verified) on Thu, 05/17/2012 - 04:24. Submitted by Anonymous (not verified) on Thu, 05/24/2012 - 02:41. Submitted by Anonymous (not verified) on Thu, 06/14/2012 - 16:19. I hardly comment, but I read some of the comments here And, if you are posting on other sites, I'd like to follow you. Could you list of all of your social pages like your twitter feed, Facebook page or linkedin profile? Submitted by Garry (not verified) on Tue, 07/17/2012 - 05:08.